Several times a year we load up some of our sheep and our Border Collies and travel to festivals to put on demonstrations. They are herding dog demonstrations, but much more. 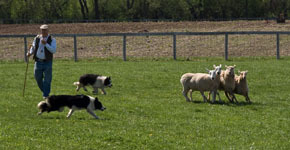 As the dogs amaze the crowds with their focused determination and quiet control of the sheep, we discuss the history of the dog-human relationship, sheep farming around the world, and ways people can improve their relationships with their own pets. We will begin this year’s series of demonstrations at beautiful, historic Kline Creek Farm, part of the DuPage County (Illinois) Forest Preserve system. This will be their Lamb and Wool event on Saturday and Sunday, April 22 and 23. We will demonstrate from 10 a.m. to near closing time at 4 p.m. Entrance to the farm and the event is free. The address is 1N600 County Farm Road, West Chicago, IL, 60185 and the phone number there is 630-876-5900. The farm’s web site is at www.dupageforest.com/klinecreekfarm. Last year this event attracted 2,700 people who thrilled at the work ethic of our dogs. On the Saturday of Memorial Day weekend, May 27, we will be at St. James Farm for their Family Field Day, doing demonstrations from 11 a.m. to near 5 p.m. This event also attracts thousands of people with events that show off horses, dogs, dairy cows, along with hayrides, guided tours, fishing, food and all sorts of things for families to do together. For more information 630-580-7025 or go to www.dupageforest.com. The main entrance to the farm is on the east side of Winfield Road, just north of Butterfield Road near Warrenville, IL. On Sunday, August 6, we will be at Naper Settlement in Naperville, Illinois for their “Naperville Plays” event. We believe this is the first event of this design at the Settlement, which is a living history site. The schedule of our demonstrations hasn’t been settled yet. But you can visit the settlement’s web site, www.napersettlement.org as we get closer to the date, or phone 630-420-6010 for more information. September 23 we will be demonstrating several times from 11 a.m. to 3 p.m. at the Lake County Fairgrounds, 1060 East Peterson Road, Grayslake, Illinois 60030, as part of their 2017 Farm Heritage Harvest Festival.